Graffoniks Take 5 is one of the best showcases Northwestern’s community has to offer. “Take 5” refers to the five-minute break dancers have in rehearsal and is also the subject for endless puns about the number five throughout the show. Each of the 16 pieces in the showcase packs a punch, with stunning lighting design, constant costume changes, captivating music and creative choreography. All 25 dancers shine in both in individual improvisational sections and explosive group routines. McCormick and Communication senior Rachel Hughes is an artistic director of Graffiti Dancers and choreographed two group pieces for the show. She says that contemporary dance, which is based in ballet, classical modern dance and jazz, meshes perfectly with Tonik Tap, whose dancers also blend styles. Hughes says the event has evolved since dancers first performed it in the now-defunct Jones Residential College . Since moving to the Wirtz ballroom last year, Graffoniks has become a larger production, complete with video transitions, lighting and more collaborative pieces. Weinberg junior Cassie Stevens is the president of Tonik Tap. She choreographed several pieces for the show. Tonik Tap dancers tackled difficult tap choreography with equal parts ferocity and smoothness. 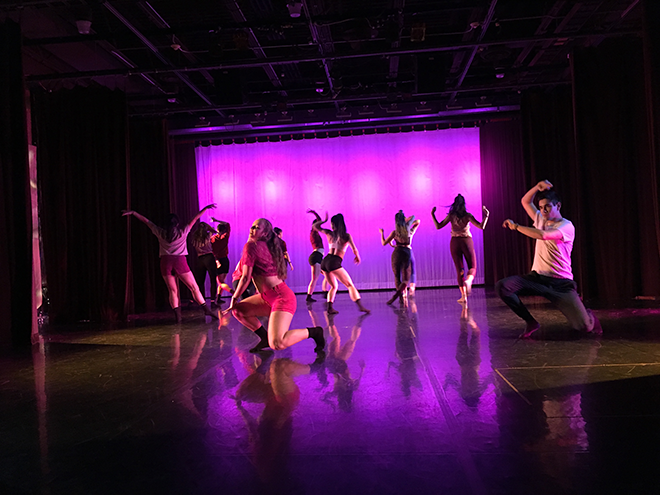 The opening number, “River,” choreographed by Isabel Alamin, challenges stereotypes about tap dancing, with intense, dark and sassy sequences. “As Tonik we really try to get tap out there, because I think people have a lot of misconceptions of tap as being--and it can be--very theater-y, like they think of the 1920s, like in the tux with a top hat. But I think what we do with tap is really different, and I hope that it translates a little bit more like, ‘Oh, this is actually a really cool thing they can do,’” Stevens said. Medill first-year Hannah Gonzalez auditioned for Tonik Tap after 15 years of tapping. She says rehearsing with Tonik Tap has been hectic but rewarding. “It’s incredible to be with this group of girls, we all have a shared passion for tapping, and it’s just like so great on a Sunday afternoon to let off steam, not think about school, not think about homework and just do something that I love to do,” Gonzalez said. If the showcase wasn’t impressive enough, many of the collaborative pieces didn’t start rehearsing until after the break. Despite the short rehearsal time, these performances are some of the most compelling in the show. School of Communication senior Drew Tanabe spent his first two years on Tonik Tap and has spent three years with Graffiti. Tanabe said he was most looking forward to performing his duet with Medill senior Cassie Majewski, who joined Tonik with him but is still in the tap group. “[Choreographing our dance together] was easy, which is not normal. It was a breeze, and we were just feeding off of each other,” Majewski said. Tanabe and Majewski’s connection and choreography speaks for itself, fluidly switching between contemporary and tap. “I just hope [audience members] realize dance is so much fun and such a release that they’ll want to come dance with us,” Tanabe said. 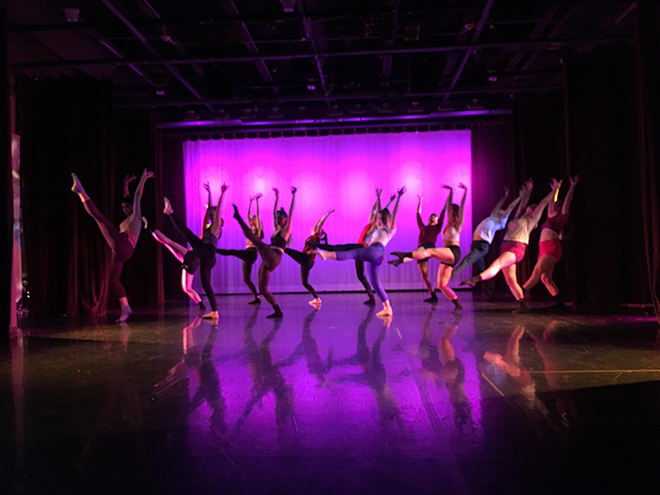 Graffoniks will "Take 5" in the ballroom of the Virginia Wadsworth Wirtz Center for the Performing Arts on Friday, Jan. 18 at 10 p.m. and Saturday, Jan 19. at 7 p.m. and 9 p.m. Tickets are $5 for students and $10 for adults.